When I put this one on from The Dress Barn, I just wasn't sure about the fit or the look. What are your thoughts? Love CDH and you girls forever! You make every dress look great. Once again; AMAZING!! Oh Michelle, you would love me in one of those large leaf bags! Love the dress, looks adorable on you!! Thank you Tina and I really wasn’t sure about this one. Sunny, a really sweet girl at The Dress Barn told me she was just way too top heavy and middle heavy to wear this dress when I grabbed it off the rack but she said with my figure it would look adorable on me! And that’s the exact same word you happened to use! Thanks for your approval on this dress! Have a super weekend, Tina! A beautiful outfit. Looking at your pics I can see you are a fashionista like me. Tee hee. Beautiful, glad you got the dress. Thank you Paula, wasn’t sure about this one like the title suggested! Seems like I made a decent pick off the rack based on the comments and numbers of likes! it is amazing on you. so eloquent. you are rocking it girl!!!! I really wasn’t sure of this one! I guess it turned out just right! 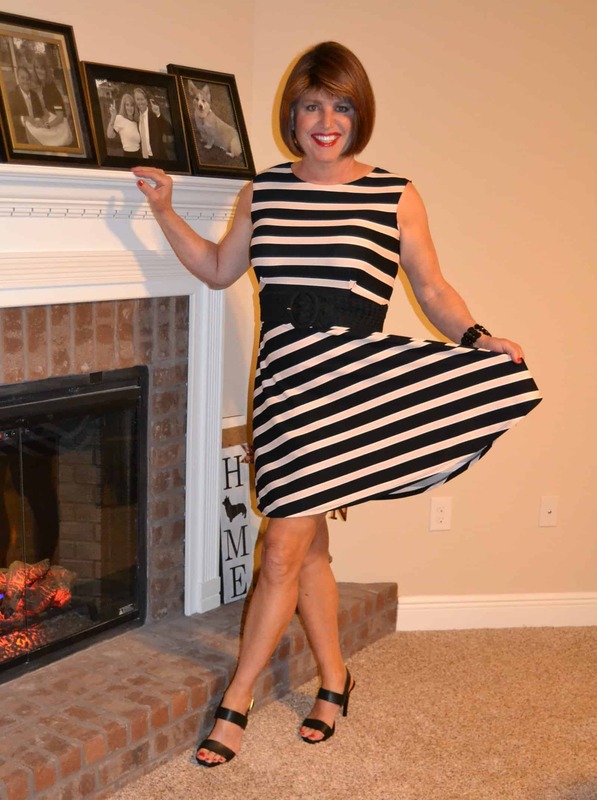 This one was an early Spring dress I found at The Dress Barn! Are you kidding me? You’d look good even in a potato sack. Speaking of a potato sack, one girl said the same thing about a garbage bag. I might take one of those leaf bags and cut some holes in the side of it for my arms to fit through and give it a try and see what happens!